The Bell Towers stretching up towards the sky belong to the Freisinger Dom, which is the Freising Cathedral located in the Bavaria region of Germany. The Bell Towers are illuminated with lights once dusk sets in on the city. These two towers illuminated in the night sky are the Bell Towers of the Freisinger Dom, also known as the Mariendom, or the Freising Cathedral, which is located in the City of Freising in the Bavaria region of Germany. One of the Bell Towers has a clock located on it. The Freisinger Dom is the co-cathedral of the Catholic territory with the Cathedral in Munich, which means that the two seats of worship share the function of being one bishop's seat. It was constructed in the Romanesque style of architecture, which was very popular in the Middle Ages and was heavily characterized by arches and among other things, large towers such as the two Bell Towers of the Freisinger Dom. in the city of Freising, Bavaria, Germany. ... It is constructed out of brick and as a result was the first brick structure to be built north of the Alps Mountain range since the time of the Romans. 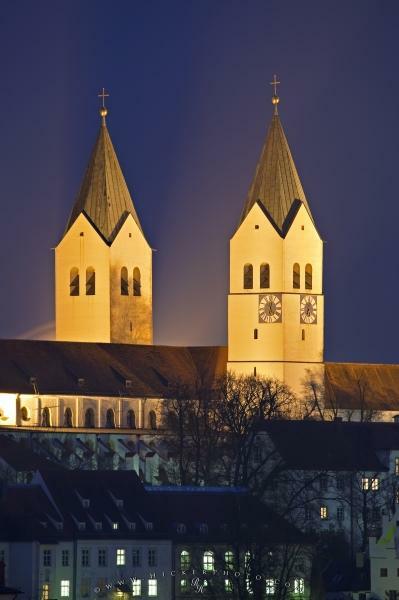 Bell towers of the Freisinger Dom, aka Mariendom (Freising Cathedral) illuminated with lights at dusk in the City of Freising, Bavaria, Germany, Europe. I photographed this photo with the digital SLR camera model Canon EOS 5D Mark II, aperture of f/10.0, exposure time of 25/1 sec. on ISO 100, as always I used a original Canon Lens, the focus lenght for this picture was 400mm.